I was getting tired of my wobbly old sawhorses and went searching for some good designs online, I found I wide variety of designs ranging from complete hack jobs to what could best be termed heirloom sawhorses made with fancy joinery and expensive wood and finishes. I do most of my work singlehanded and I am always clamping stock to saw horses in one orientation or another, so a design with a number of faces is important to me. I cobbled together the design above in Google Sketchup combining some of the best features from the designs I found online. 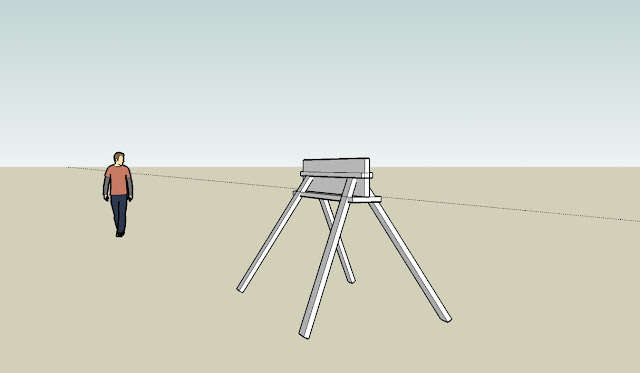 The modified I-Beam work surface is comprised of a verticle 2x12 and two horizontal members, one 2x4 and one 2x10, both providing anchor points for the legs. The 2x4 horizontal surface secures long stock clamped to the verticle 2x12 for planing or routing or whatever. I haven't put the finishing touches on the design yet, and I am tempted to make the top horizontal board wider to allow you to clamp horizontally oriented stock more securely and to possibly provide more reinforcement via trusses or shelves to the lower legs, after I finalize and build I will post an update.